Virtue was one of our foundation mares and has won many championships for us. She has produced some outstanding offspring and her two sons by our chestnut stallion Weewaif Bath Oliver, Brockville Venture and Brockville Vintage are both now licenced stallions. We have retained two of her daughters for future breeding purposes, Brockville Vermillion and Brockville Verona. Virtue has now been retired from breeding having had her last foal in 2010, another stunning bay colt, Brockville Vermont again by Oliver who we are very much looking forward to showing. Marra is a gorgeous 40.5" young mare who has taken a long time to mature but the wait has been worth it. 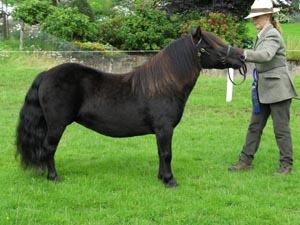 In 2012, she won the Standard & Supreme Shetland Championships at Tarland Agricultural Show and the Shetland Championship and Reserve Overall Light Horse Championship at Banchory Show. 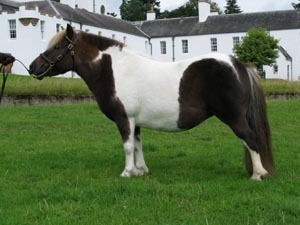 Her win at Banchory qualified her for the NPS Scottish Farmer/Scottish Horse M & M In Hand Championship at Blair Castle at which she was highest placed Shetland and stood second in the Small Breeds section to the eventual Champion. She is now having a well earned winter off and will return to the show ring in 2013. Merry is one of our favourite mares. She was only shown once when she won the yearling class at the Royal Bath & West Show. She has been a prolific breeder of fillies and we currently have four of her daughters, Merry Meg, Merry Margo, Merry Morag and Merry Mischief in the stud. One of her sons, Merry Maestro was gelded and is now going nicely under saddle. Her last foal born in 2011 is a lovely rich red bay called Merry Mac who will be available for sale in Spring 2013. He is by Brockville Venture and is expected to mature at 41". Millie as she is known in the stud, is the full sister to our two home bred licensed stallions, Venture and Vintage. 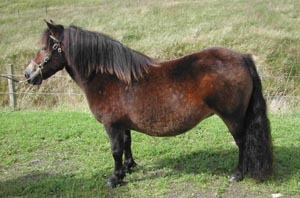 She is one of the rare finds in the Shetland breed being a full 42". 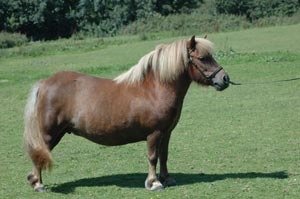 She was shown for the first time at the Shetland Pony Stud-Book Society Breed Show in Shetland in 2009 where she was 3rd in a very large Coloured Yeld mare class. She is a beautiful mare who is the very image of her dam, Hose Virtue. In 2007 she had her first foal, a colt, Verdi, by the black stallion, Stow Vulcan. 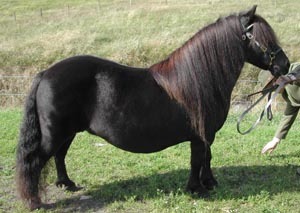 Meg won many in hand Championships as a youngster and in 2004 won the three year old coloured filly class at the International Shetland Show in Belgium. She is one of four daughter's of our chestnut mare, Weewaif Merry Melody who have been retained by us. In 2007 Meg had her first foal, a beautifully marked skewbald filly by Brockville Venture who has also been retained. Meg then spent three years away on loan to Mrs Beryl Rae at the Samber Stud in Devon where she was produced under saddle being ridden by Eve Richardson. During this time she won numerous classes from Lead Rein to Open Ridden as well as a large number of Ridden & Young Handler Championships. Meg is now back with us and we look forward to showing her in hand again in 2013.